The War of Wrath (545-587 Y.S.) - Although it would come at a cost, the voyage by Eärendil into Valinor proved successful. For the Valar had decided it was time to deal with Morgoth once and for all. For only the second time (see Valar Assault Utumno) the host of Valar left the Undying Lands and journeyed to Middle Earth. And Melkor was caught off guard. "The meeting of the hosts of the West and of the North is named the Great Battle, and the War of Wrath. 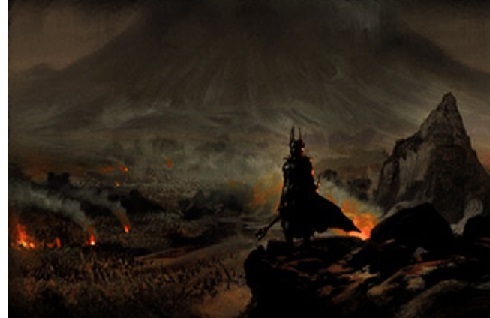 Therre was marshalled the whole power of the Throne of Morgoth, and it had become great beyond count, so that Anfauglith could not contain it; and all the North was aflame with war. But it availed him not. The Balrogs were destroyed, save some few that fled and hid themselves in caverns inaccessible at the roots of the earth; and the uncounted legions of Orcs perished like straw in a great fire, or were swept like shrivelled leaves before a burning wind. This time the Valar were without mercy.